Random information, thoughts and whatever piques my curiosity....and gardening. Reading the new Anthony Bourdain article, which was awesome by the way, brought up a conversation I had with a coworker a little while ago. I will preface this rant with an admission, my child is still in utero so I have no practical knowledge of child rearing but I have never let practicalities stand in my way. A coworker who knows my aversion to fast and processed foods asked me if there is anything that I missed eating. I replied that I liked chicken mcnuggets when I was a teenager. She asked how long it had been since I had one. She was aghast when I answered,"More than a decade." "But what about when you have your child? Won't you take him to the play area or get him a happy meal?" I told her that the park would have to do because I wouldn't feed that stuff to anyone. How is it weird to keep food away from my child that has been linked to obesity and diabetes, contains mercury and is addictive? How is it different than protecting my child from the many other dangerous things he is going to want to do? 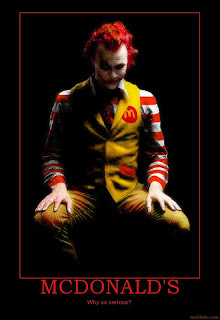 The average American eats 159 fast food meals per year according to Kathleen Aicardi, M.Ed. so I acknowledge that I am in the minority. Even so I will continue to vote with my wallet and buy and grow healthy food for my family. Sorry for the linkfest but I am always asked for citations on this stuff. I would like to acknowledge the creator of the picture above but I was unable to find a source. I have no direct link for the Kathleen Aicardi, M.Ed. info because the old link doesn't work. I will climb down off of my soapbox now. 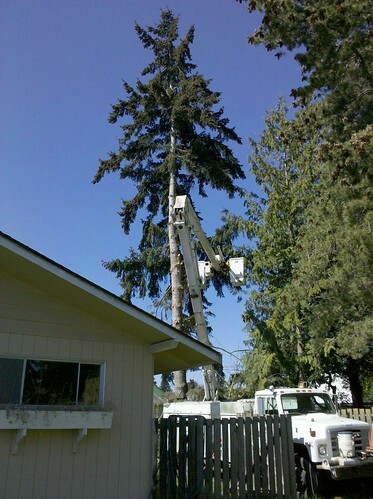 Blue Mountain Tree Services came over and removed a nuisance fir tree and a danger pine tree. 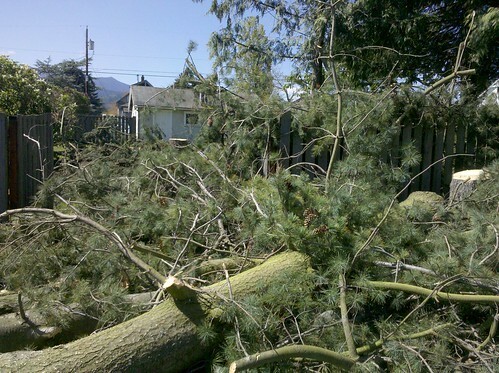 The fir tree was just outside our bedroom and it rained cones and branches on the house every time the wind blew. After the last storm we were ready for it to go. 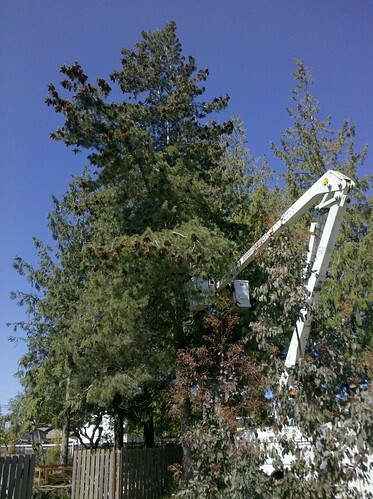 I called them in for the fir but when Jeff saw our pine tree he immediately noted that is was dangerous due to it's double top and multiple widow makers. It was also directly outside our newly painted nursery-to-be and baby trumps tree in the Jered version of the roshambo. I will be busy with this mess for a while. Hopefully I can get this taken care of and get my scheduled plantings done. 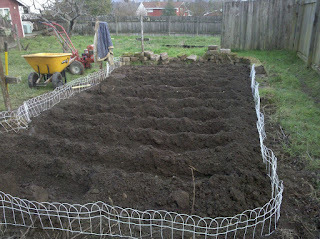 As for the garden, I hope to get my second planting of beans and third planting of peas in. I might plant the tomatoes out :) , get the second and third plantings of greens in and the peppers out to the green house. The grapes are all going crazy except my Price which seems to have bought the farm. What am I going to do with all of this space opened up by removing these large trees? Fruit! I should be able to get another 6 trees in this space. I might even find the Pawpaws I have always wanted. I am really excited about that! I am planting like crazy and having a great time. It would be better if I wasn't coming down with a cold but what can you do. Ron loaded dirt in the greenhouse while I planted greens, 60 feet of lettuces and 30 feet of chards. I am really enjoying myfolia.com. Check it out on the right sidebar. It keeps track of everything I plant. It also connects me with like minded individuals so I don't bore my friends and wife to tears. It is amazing that there are people who don't want to talk about gardening all day. 1 bed done and all the rest to go. I moved the compost pile also since there was a little light left. I am really enjoying the whole process. Ron rototilled again tonight as well. I think we will get the greenhouse done and the greens plant this weekend. Fingers crossed. I feel really good about what I accomplished today and the weather was great. I started the day by hauling a couple of loads of compost and wood chips to get the clay soil amended. The rototiller made quick work of the small plot (thanks Ron for getting that thing running so well). I like the trench method for potatoes so I put my shovel to work and dug 13 furrows. I planted 70 potatoes and 2 horseradish (because I wanted to). I still have 2 open furrows for either yellow finn or cranberry red (AKA all red), whichever I find first. I have started using myfolia.com so you can check out everything I have growing. This site was suggested by the Geek.Farm.Life podcast. Thanks Andrew and Misty. I really, really, really need to get some other things done but prepping the patch took 6 hrs and I was ready for a shower. I am behind on the greens and garlic. I need to transplant the onion starts to the garden and re-pot the cucumbers. The work is starting to pile up but it will all get done, sooner or later. I am in to what I have heard called, "good enough gardening". The rows aren't straight and things get in late but it is just a hobby and that will just have to be good enough. It's just my yard anyway. It has been raining for most of the week so I have gotten nothing done... and the Olympics opening ceremonies because they are on. I plan on spending at least 1 day this weekend out there, rain or shine. If I wake up and it is raining, I am going to take the wife to Silverdale for maternity clothes because she needs some. It is our first child so she still needs to get geared up. Anyway.... the wet has kept us from gluing the seams on the greenhouse so I might get that done if it clears up. If not, I am going to top-dress the greens area and plant something. I know it is February but the temp is plenty high enough. I planted some lemon cucumbers in the house and they sprouted in 5 days. I have planted them out doors before and it took weeks for them to get going. Now what am I going to do with them for the next month? The strawberries have been exactly the opposite. There has been about 20% germination and they are super small still. Everything else seems to be going to plan though which is amazing. I really need to get on the garden plan but I have never had a garden big enough to need one so I don't know where to start. The best way I know to start an overwhelming job is to pick something and to it. That is the next step. The opening ceremonies really improved after the Bryan and Nelly song got over. They have done an incredible job. It is so beautiful. I loved the native thing during the march as well with the dancing in costume. Great job Canada. 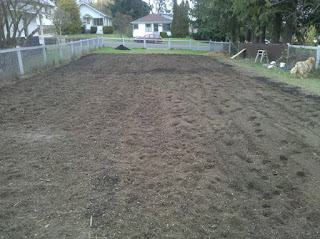 Rototilling is done so now to the green house. Ron has been happily rototilling along. 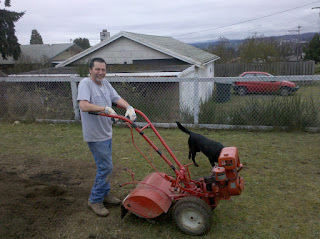 Cousin Kenny and I got the compost spread out yesterday morning and Ron finished mixing it in. The dirt looks great for a first year garden. The coffee grounds, wood chips, compost and elbow grease have changed this lot from a playground into someplace you can grow food. Next up is the greenhouse. 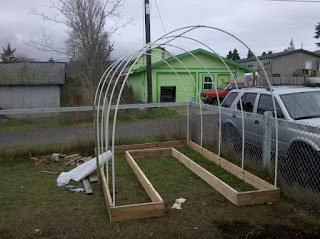 It is going to be 8' X 12' with a 2' raised planting area around the bottom. There will also be some work tables but we will figure them out later.